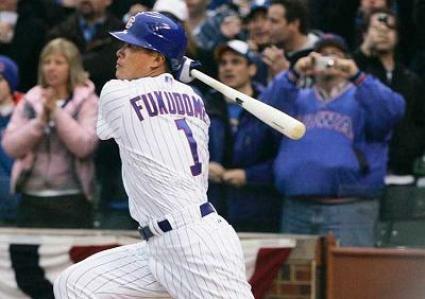 Lots going on today in the world of Cleveland sports, starting with the Indians trading with Chicago for outfielder Kosuke Fukudome. We’ll admit our first reaction was “that’s it?” as Fukodome isn’t the big bat the Tribe needs right now, but we came to realize that, at a minimum, Fukodome is an upgrade over Austin Kearns and Travis Buck (who was designated for assignment after the trade). As the always reliable DiaTribe points out, Fukodome’s .742 OPS would put him fourth among current Indians behind Travis Hafner, Asdrubal Cabrera and Carlos Santana. Fukodome doesn’t hit for power, only 20 extra-base hits and three home runs this season, but he does get on base at a consistent level and, as having runners on the bases greatly enhances your chances of scoring, that’s a good thing – especially with this team. Not to be outdone by the Indians, the Browns made several moves of their own on Wednesday. To no one’s surprise, they released quarterback Jake Delhomme, who injured his ankle in the season opener last year and was never able to get what was left of his game back on track. The team also reportedly signed second-round draft picks Jabaal Sheard and Greg Little; having them in camp from day one will be nothing but positive. The Browns also agreed to a contract with Usama Young, a safety and former Kent State Golden Flash who played the past four years with New Orleans. Young was a third-round draft pick of the Saints, playing safety the past two years and contributing on special teams for the past four. He recorded three interceptions and one sack in limited duty on defense. Young played with current Browns linebacker Scott Fujita in New Orleans and with Josh Cribbs at Kent State. No doubt Cribbs and Fujita briefed the coaching staff and front office on what Young brings to the table. And as Kent State has produced more Pro Bowlers in recent years than Ohio State – and did it without cheating – what’s not to like about the signing? Finally, the Browns reached a deal with Brandon Jackson, who should fit nicely as a third-down back in the West Coast offense. Jackson caught 43 passes with Green Bay last season and has 110 receptions in four years wiht the Packers. He also rushed for 703 yards last year. He’s also only 25, so he comes to the Browns without a lot of mileage. The Arizona Cardinals took the bait and traded for Philadelphia quarterback Kevin Kolb on Thursday, surrendering a second-round pick and staring cornerback Dominique Rodgers-Cromartie, a Pro Bowler in 2009. In addition (as if that wasn’t enough) the Cardinals are expected to sign Kolb to a $63 million, five-year contract that includes $23 million guaranteed. All for a quarterback that has seven career starts in the NFL. So why would anyone think that Kolb is an upgrade over McCoy, especially at $63 million? We were shocked at the news that Bob Bradley has been relieved of his coaching duties for the U.S. national soccer team. As we’ve learned over the decades here in Cleveland, firing the coach is the easy part. The hard part comes when you have to find a replacement that will take the team to the next level. According to Grant Wahl at Sports Illustrated, the next coach “will not be a surprise,” which means that German legend Jürgen Klinsmann is probably on tap to replace Bradley. If Gulati is targeting Klinsmann, he better hope he can seal the deal; Klinsmann has turned down opportunities to coach the U.S. team after each of the last two World Cups. The one thing we’ll say is, if you have to make a move, you want to do it now before the next World Cup qualifying cycle begins.